No other info available from index. Note: Married Wilhelmine Louise Kleinschmidt (1835-1882). Settled in town of Berlin, first, then in Corning, Lincoln, Wisconsin. Arrived on board the Wieland 7 Jul 1857. 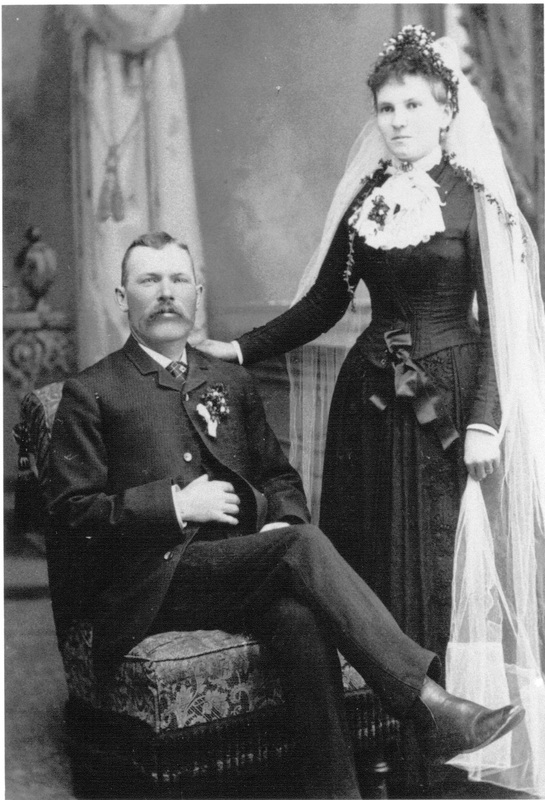 Note: Possibly son of Heinrich Krüger and Johanna Zimmermann, married 21 Sept 1901 in Corning to Annie Kudick, daughter of August Kudick and Minna Zastrow. Note: Son of Wilhelm Krüger and Caroline Hoge. Note: Son of August Krueger and Caroline Albertine Wilhelmine Milläger. Note: Franz Krueger, son of Ferdinand and Johanna Krueger. “Hermann Krueger, born in Germany in 1859, arrived in NY in June 1886”. “Carl Krueger, born in Germany 1854, arrived in NY in April 1885”. Naturalization records for the name Krueger/Krüger pulled from the Marathon County repositories. I’ve added some information and links to many of these based on the various records mentioned in the index. Date of Hearing: 10 Mar 1863, Vol A, p 27. Date of Hearing: 17 Aug 1869, Vol A, p 77. Date of Hearing: 17 Aug 1869, Vol A, p 83. Date of Hearing: 16 Aug 1870, Vol A, p 161. Date of Hearing: 23 Aug 1871, Vol A, p 170. Date of Hearing: 14 Apr 1880, Vol A, p 386. Date of Hearing: 14 Nov 1887, Vol B, p 103. Date of Hearing: 2 Dec 1887, Vol A (index says B), p 113. Date of Hearing: 24 Mar 1888, Vol B, p 122. Date of Hearing: 24 May 1891, Vol B, p 316. Date of Hearing: 28 Nov 1892, Vol B, p 333. Note: Seems to be Wilhelm Friedrich Krueger, born Nov 1860. 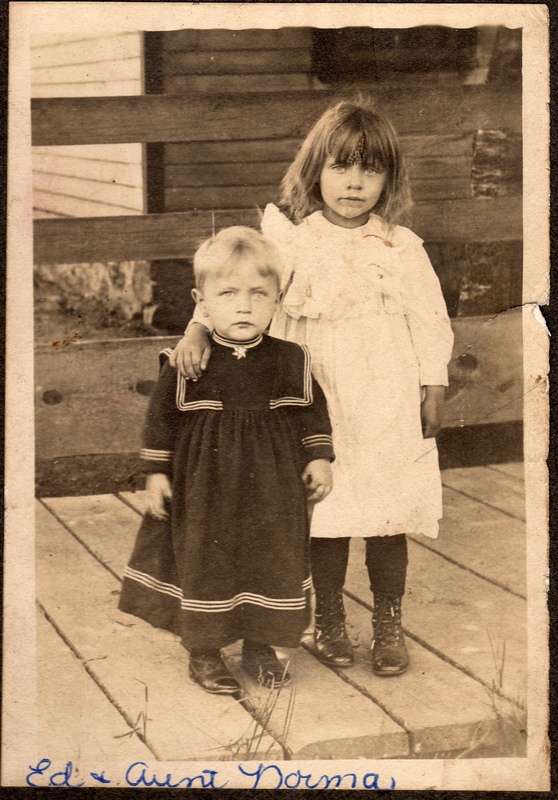 Children: Otto W G Krueger & Emma Louise Bertha Krueger. Witnesses: Gustav Neitzke, 520 Chicago Ave, Wausau, Charles C. Krueger, 519 10th St, Wausau. For Christmas this year, I decided that I wanted to get my mother and father DNA-tested through Ancestry.com. While it’s true that my family tree is extremely well-elucidated and researched, there are still pockets where certain things are unclear. For example, I only know back to my 3x great-grandparents on my Krueger side (due to records from Pomerania being difficult to find and the common nature of the family name), so if we matched someone in the world who had Krueger ancestors it would indicate a link between those families despite the absence of documentation. Similar situations are present for many of the Irish lines of my family due to the scarcity of records from Ireland. So at Christmas this year my mother spit into a test-tube and sent off an envelope to be analyzed. Yesterday we got the results back. My mother’s DNA matched at least 20 people “closely” (5th cousins or better). I’ll have to investigate each one! It showed that she has 19% DNA from Scandanavia (that would be the Norwegian side, Hanson and Olson), 32% “Europe East”, which would be the Prussian stuff (Krueger, Hoge, Schmidt, Zierke, Schulz, Winkelmann). Then 38% from “Great Britain”. I assume this is the Irish from the Mullins, Hammond, and all the British stuff from the Curtis side of my family. Then there’s 9% of the DNA marked “Other”. So my maternal grandfather was 50% Prussian, 25% Irish, 25% English, and my maternal grandmother was 50% Norwegian and 50% Prussian. That makes my mother 50% Prussian, 25% Irish/English, and 25% Norwegian. The DNA results have much more “Great Britain” than predicted. No idea what that means. On the Schmidt side of my mother’s family there was a family rumor that someone in the family brought back and married a “Mongolian Princess”. Interestingly, my mother’s DNA shows 2% of her genetics are from “Asia Central” which is the area around Turkmenistan and Northern Iran. Very interesting! As time goes on and other people are tested, we can see if more matches are found. A couple Summers ago I was fortunate enough to get to spend the afternoon with Jim and Marlene Strehlow, who, along with Jim’s late siblings Virgil and Marilyn Strehlow, have been the keepers of a vast and detailed family history for the Strehlow, Christian, Voigt, and Genrich families from the Town of Maine in Marathon County, Wisconsin. 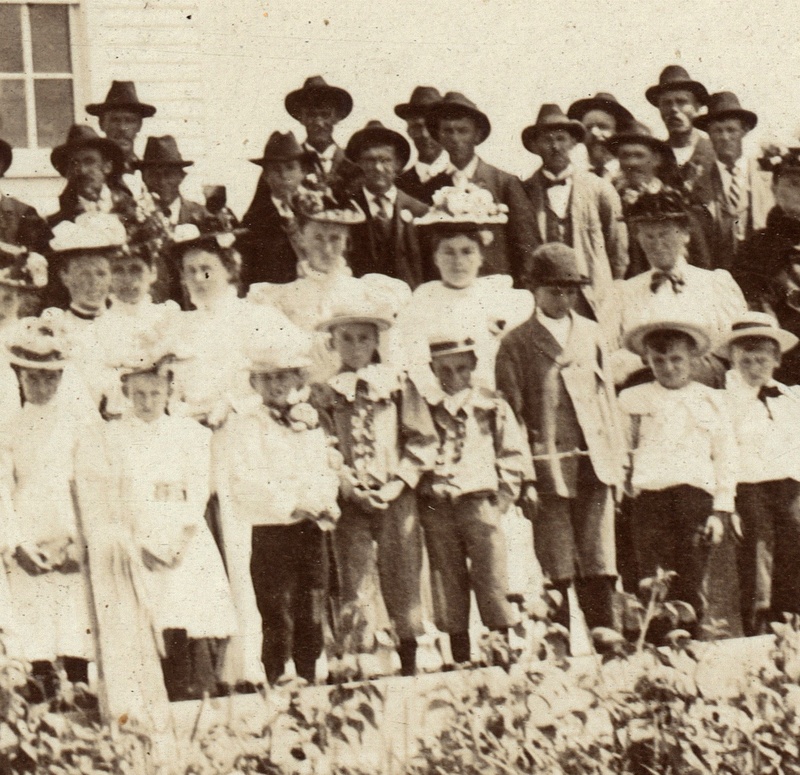 Among the treasures that are curated by the Strehlow family are several group photos taken at weddings in the Towns of Berlin and Maine. I have long entertained fantasies of somehow identifying all the people in these photos; there are certainly some people who are seen in more than one of them. I’m afraid, however, that the people who could have identified most of them likely passed away about thirty years ago. My hope now is that individual descendants might be able to identify specific people based on family photos they would have. So, out into the world they go… time for some “crowd-sourcing”! I’ve posted this photo previously. 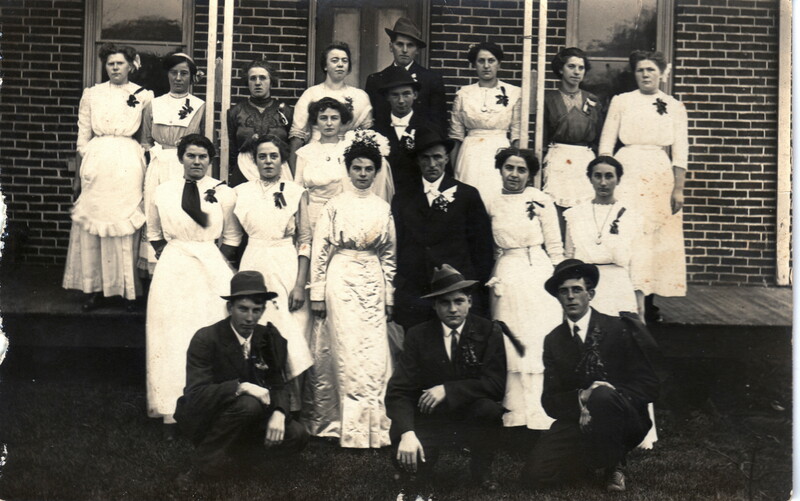 It shows the wedding of Albert Garske and Ella Baumann taken on Oct 4, 1919 at the Baumann homestead in the Town of Berlin, located at 14656 Berlin Lane, Merrill, WI 54452. Only four people are identified in this photo (see previous article). 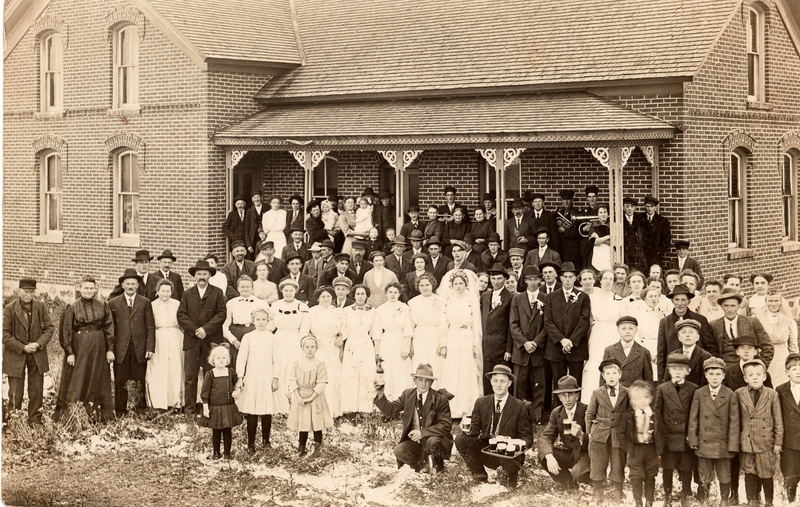 The next four photos are from the marriage of Rhienhard Carl Julius Christian (1881-1963) and Ella Neitzke (1890-1940) in the Town of Berlin, Wisconsin, on 20 Nov 1913. There are a few people besides the bride and groom that I recognize. 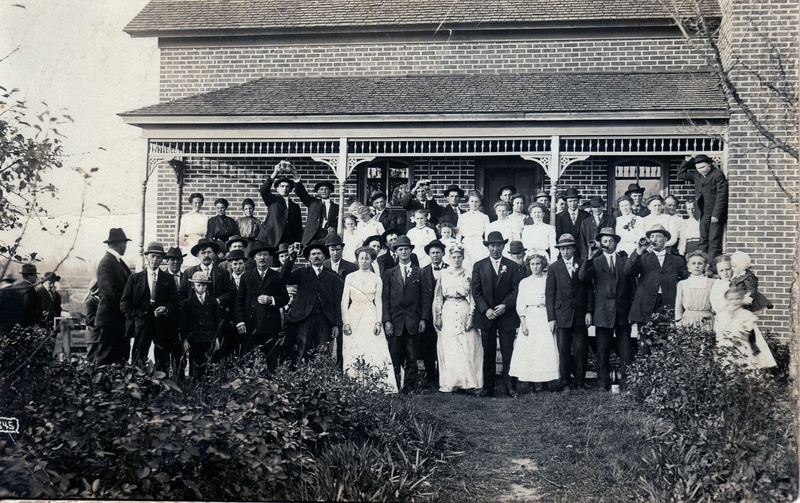 In the back row right, just to the right of the pole and wearing a hat and a stylish mustache, is my great-great-grand-uncle Carl Bertold Krueger. 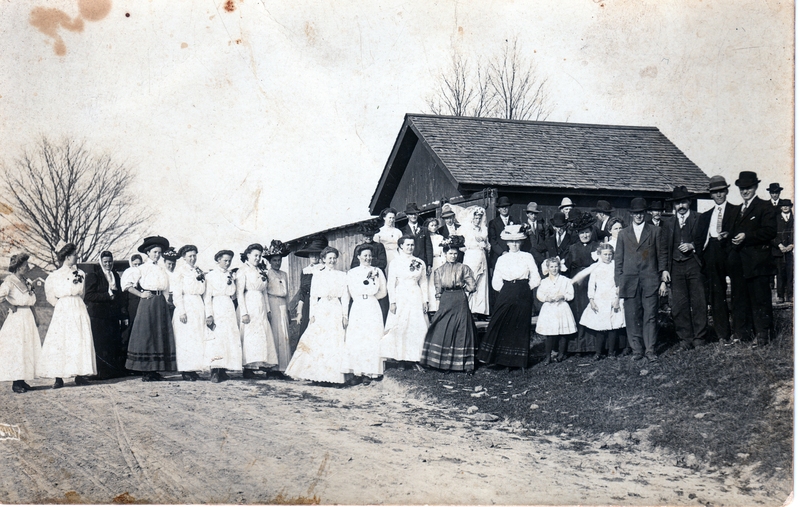 His daughter Helen Krueger is three people to the left of the bride, wearing an apron. There are two ushers kneeling in the front holding bottles of brandy. 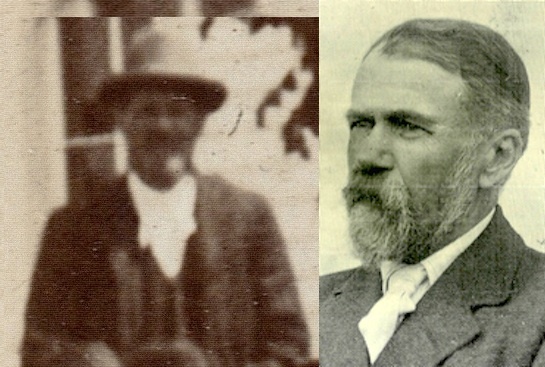 The one on the left is Carl’s son Wilhelm “William” Krueger. 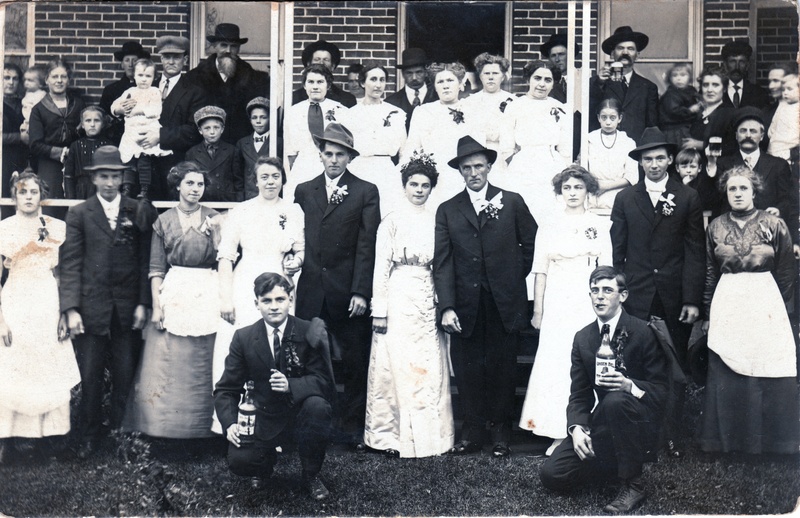 The other thing I noticed is that the band in this photo (lower left) are all the same men as the band in the photo above (Garske/Baumann Wedding). Another photo taken at the same occasion. Carl Krueger is in the back again, this time holding a mug of beer! One more from the same wedding. Just the wedding party this time, I’m guessing. William and Helen Krueger are present again. 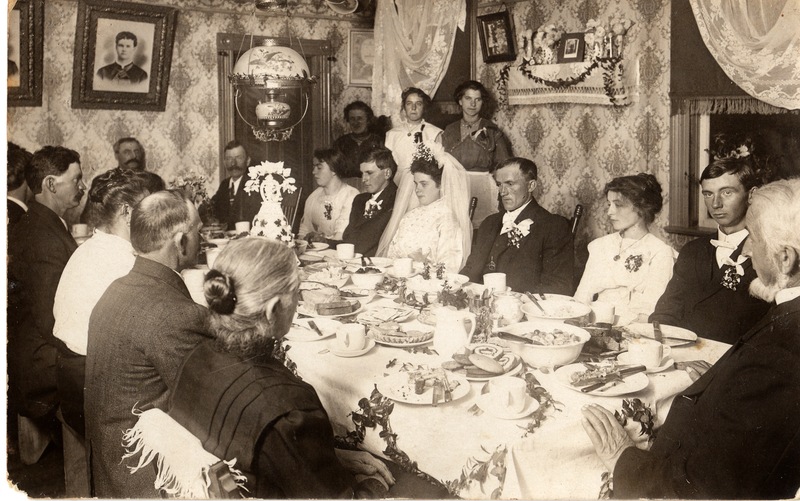 This oddly somber and uncomfortable-looking photo is from the wedding dinner for the same Christian/Neitzke wedding as above. The bride and groom are easy to spot, and behind them (between them) is Helen Krueger. The other people, including those in the portraits on the wall, are unknown. I have no information at all about these next two photos, except that both show the same wedding. They were clearly taken around the same time at the others, so between 1910 and 1920. I’m guessing a careful analysis would show some people in these photos are also in one of pictures above. The second one is much less formal, and the women are wearing their stylish hats. Again, if anyone knows more about these photos or any of the people in them, please contact me! 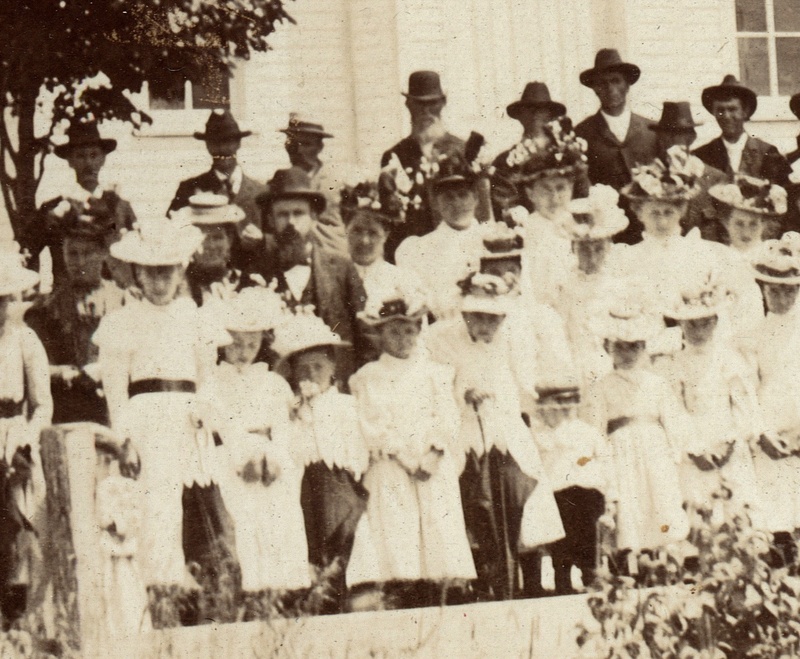 I first saw this photo hanging on the wall of Grace Lutheran Church in the Town of Maine, Wisconsin at some point in 2012. 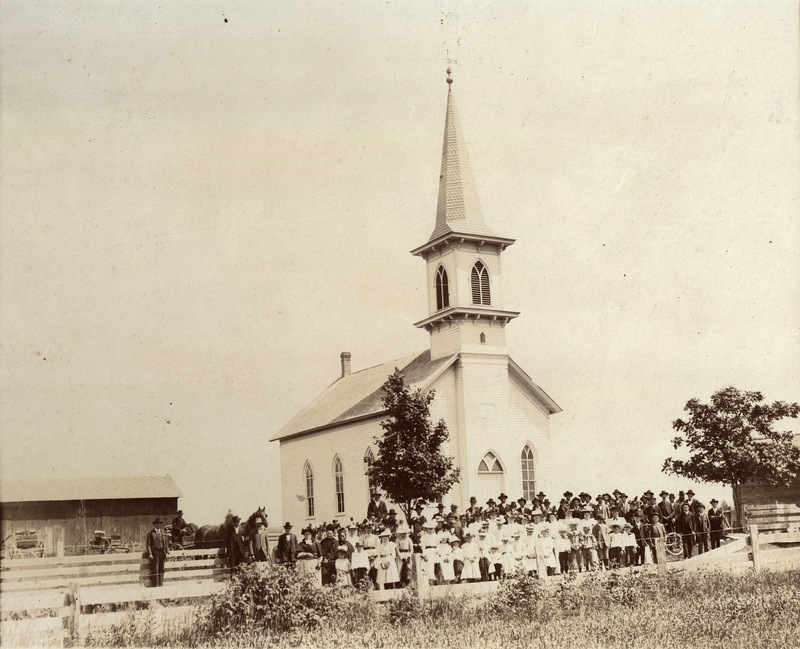 The pastor for Grace, Nate Biebert, is a devoted and passionate historian who has spent a great deal of his time investigating the history of the church he currently leads. We had discussed this photo on several occasions, and he was generous enough to find the time to scan it for me at a very high resolution. 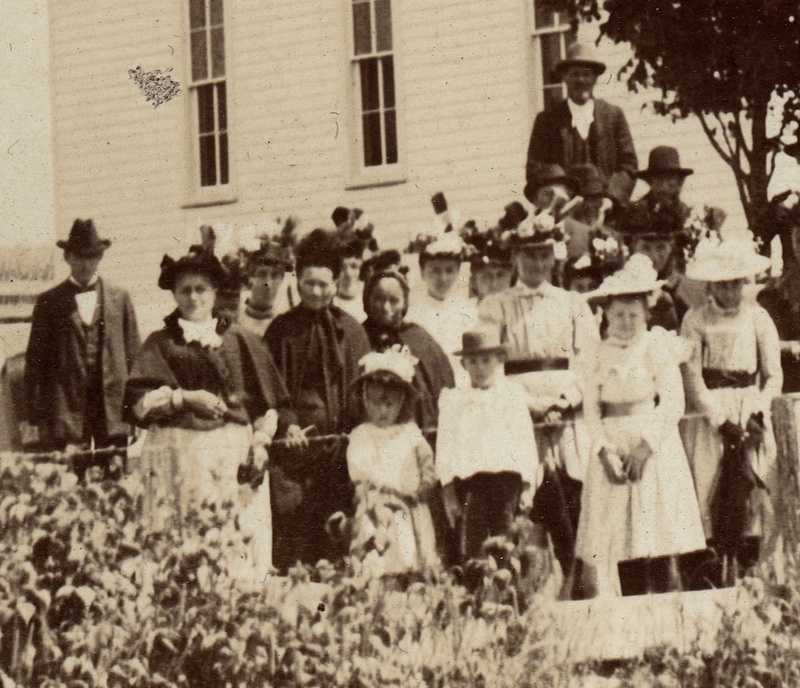 The photo, taken about 1900, shows Grace in the background with her congregation gathered in front. The photo is not quite clear enough to easily identify individual people, but I’ve included five detail photos showing the attendees. 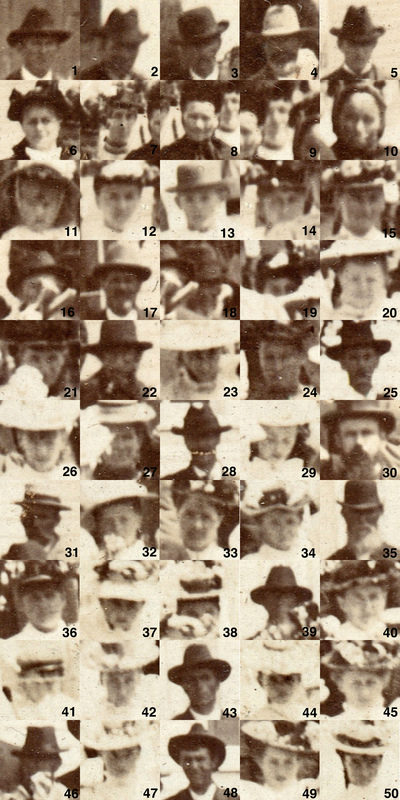 There are 89 people in the photo. Everyone is very well dressed. You can see that all the boys are wearing suits… there are even two boys from a family with what look to be matching “tuxedo-style” ruffled shirts [detail photo 4]. Several have matching hats. One family of girls all have matching parasols [detail photos 2 and 3]. Many are wearing gloves and/or cloaks [detail photo 2]. Most of the older women are wearing what would have been very trendy gaudy hats [detail photos 3 and 4]. Not one single person in the photo has a bare head. Everyone is wearing a hat. So it seems to me that either a) everyone always wore their very best matching suits to church on Sunday or b) everyone knew the photographer would be coming by that day. The latter seems much more likely. It does not seem impromptu at all. 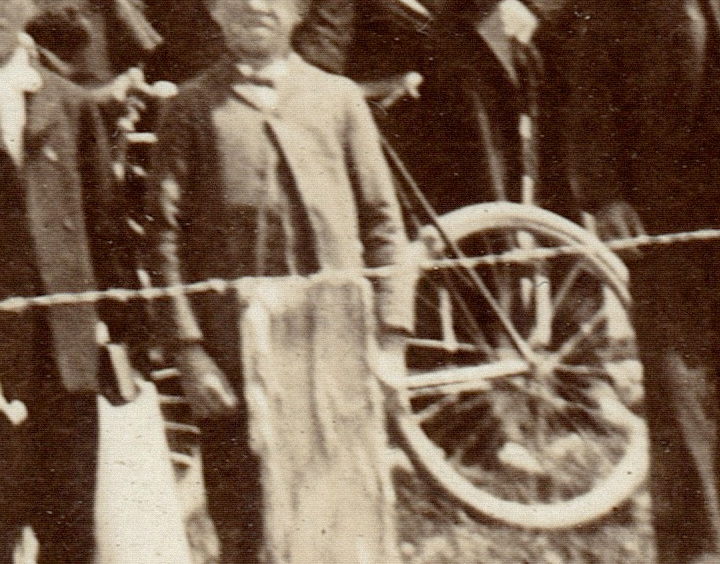 The position of the pastor above his “flock” [detail photo 2], the man with the wagon [detail photo 1], the bicycle [see below]… another prized possession of someone.. it seems to have been very new considering the model and the year of the photo, the matching outfits, stylish new hats, etc. All point to an arranged photo session that day. So here are the individual faces. All 89 of them. They are listed pretty strictly from left to right. If, for some reason, you are able to identify any of these people, please get in touch and let me know. So far only two are identified. 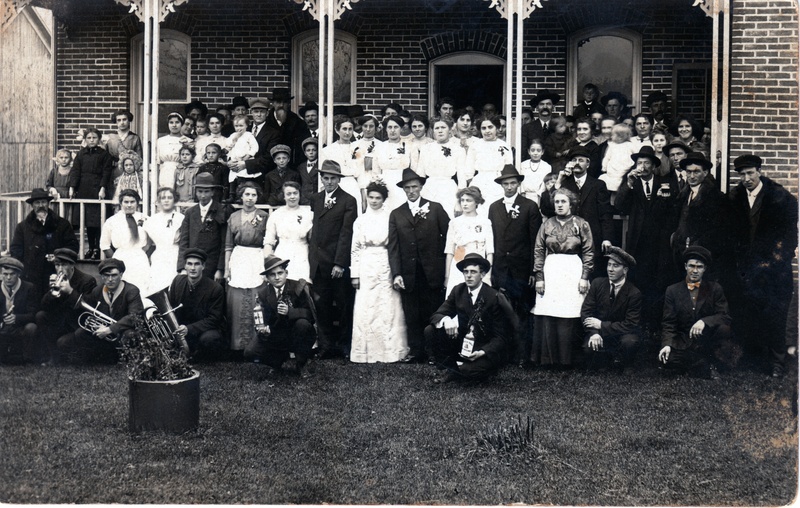 Of these people, I have a feeling that #25 may be my great-great-grandfather, Heinrich Krueger. I’m hoping my cousin Lisa will be able to locate a copy of a photo she has taken about this time-frame which could confirm his identity. 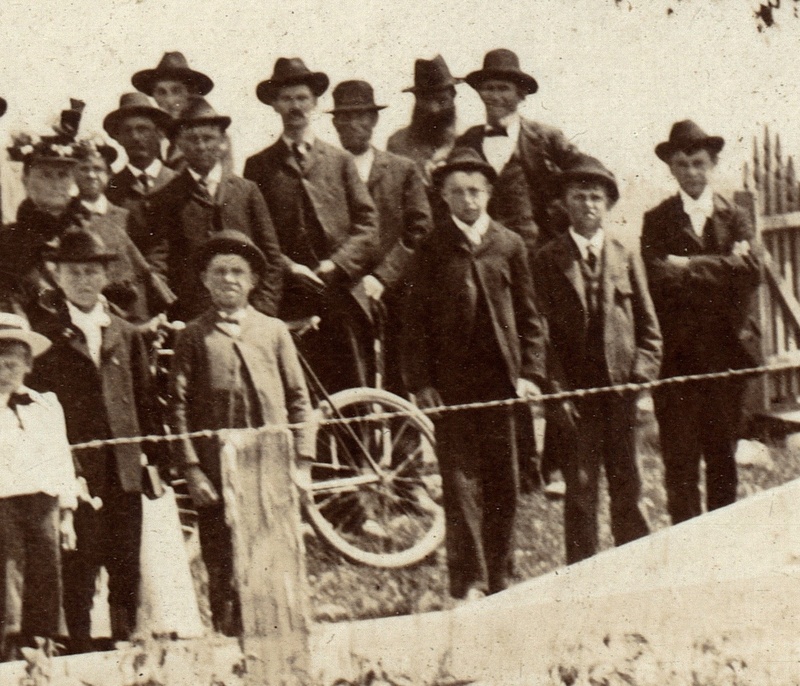 Pastor Beibert and I believe that #17 is likely Pastor John Rien, who was the Grace pastor from 1895 to 1903. 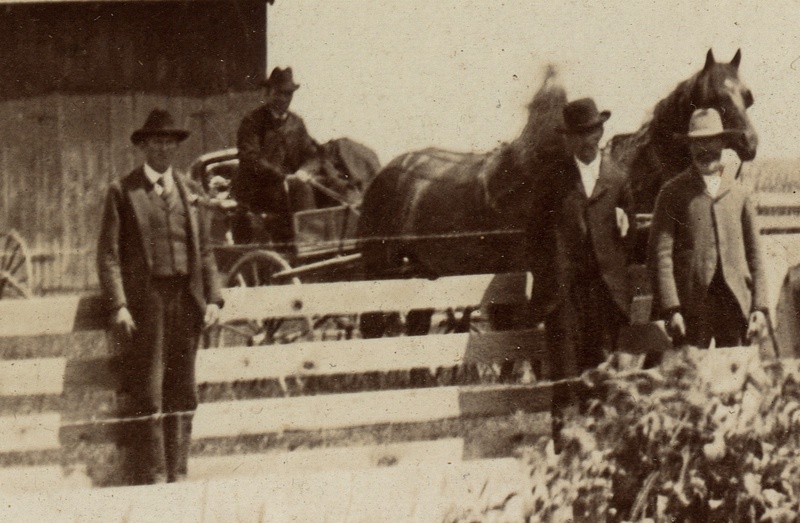 That narrows down the year of the photo pretty well, confirming our belief that the photo was taken about 1900. 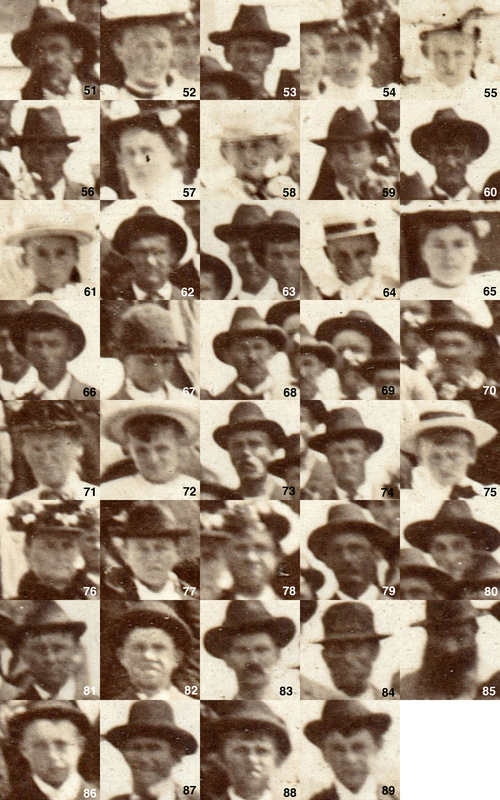 Of these the only one I know for sure at this point is #83, who is my great-great-grand-uncle Carl Bertold Krueger. One of the frustrating and exciting things about genealogy is that you can revisit the same information over and over again, sometimes years later, and find things that you didn’t see before. As you learn more and more about your family history, names that didn’t mean anything to you at one point will jump out at you as very important later. This happened to me tonight. This is the baptism certificate for my great-grand-uncle, Edmund Karl Franz “Eddie” Krueger, who was born on 12 Jul 1902 in Wausau, Wisconsin and was baptized at St. Stephens in Wausau on 31 Aug 1902. Werda glauben getauft wird der wird selig werden (Whoever believes and is baptized will be saved), Mark 16:16. 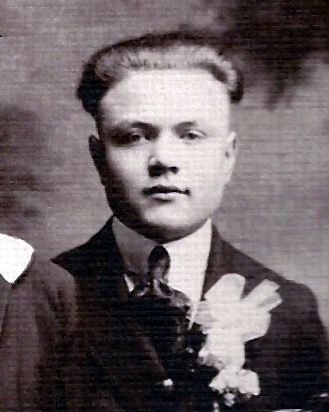 Edmund Karl Franz Krueger, born 12th July, 1902, son of Heinrich Krueger and his wife Bertha née Kamrath, on the 31st August, 1902, in Wausau, Wisconsin, has been baptized in the name of the holy trinity. 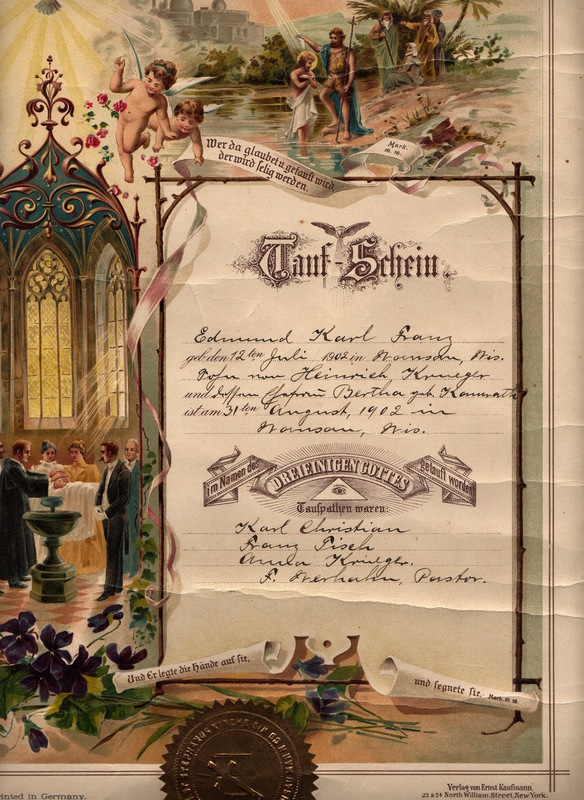 I know much more about Prussian christenings than I did when I got this baptism record from my cousins Tom and Virginia Krueger about two years ago. The family didn’t just pick anyone to be a godparent. Often two adults and one young woman were chosen, and they were usually related to the family, either by blood or marriage. “Franz Tisch” was Franz Joseph “Frank” Tisch (b 1863) who was the brother of the husband of Bertha Kamrath’s sister Helene Kamrath. Helene was married to Joseph Tisch, and Franz was Joseph’s brother. 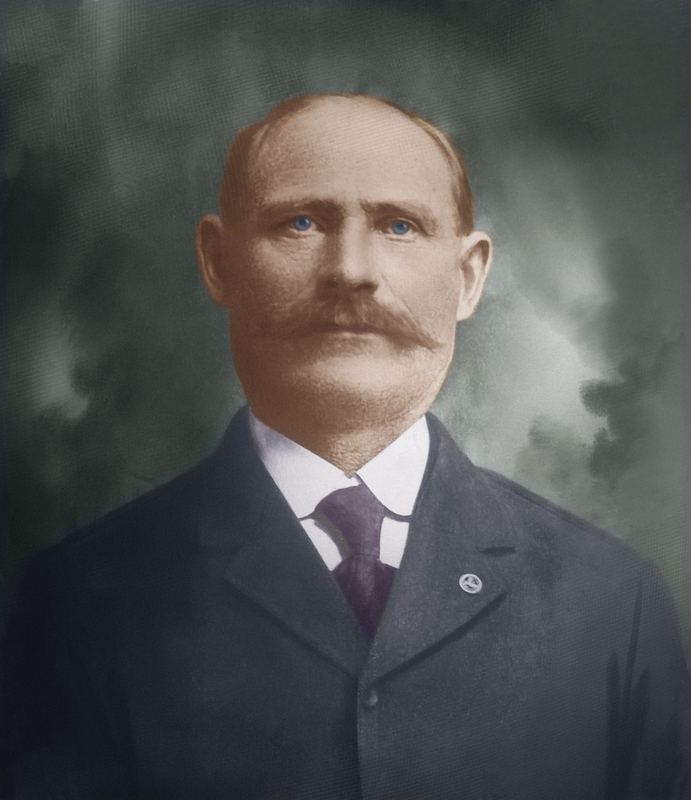 “Karl Christian” was Carl “Charles” Christian (b 1860) who would eventually be related to the family three different ways. At the time of Eddie’s birth, however, he may have been only a close friend of the family. The next Spring Carl’s son Anton Christian would marry Bertha Kamrath’s niece Annie Wymer. Annie was the daughter of Bertha’s full sister Auguste Kamrath Wymer Otremba. 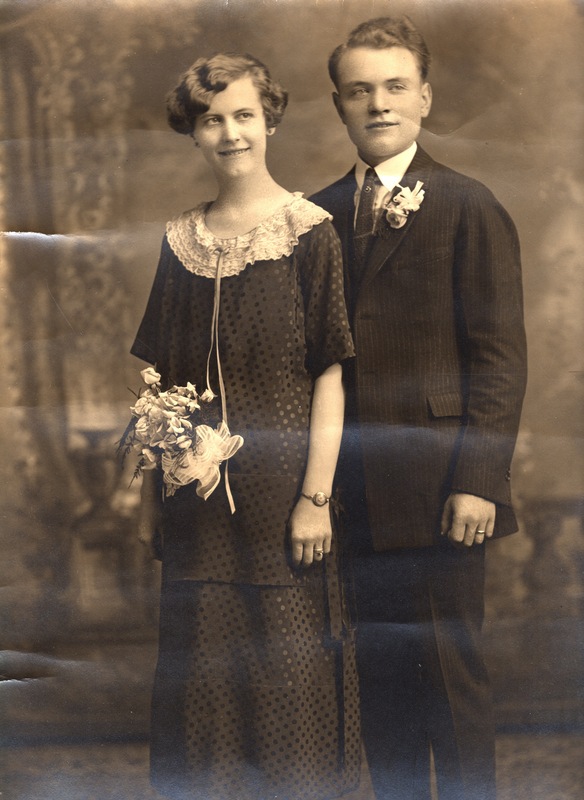 Annie and Anton were married in April of 1903. Carl Christian was also the uncle of Anna Krueger’s eventual husband Carl Friedrich Daniel “Charley” Christian. 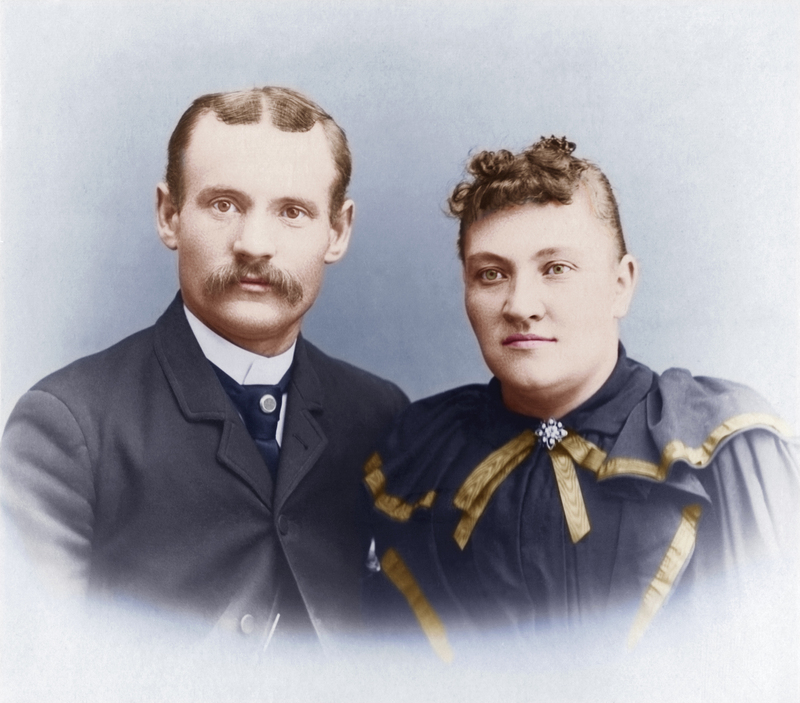 They were married in 1907. 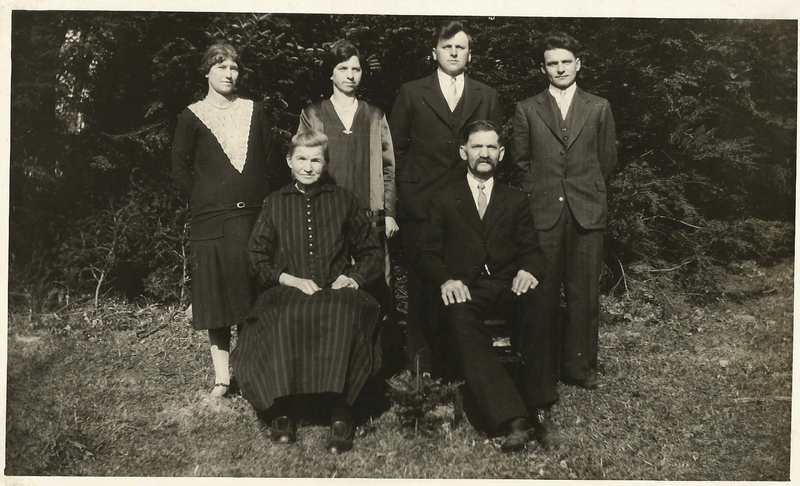 The Christian family also became related to Bertha Strehlow’s family later when Arwin Strehlow married Angela Christian in 1929. “Anna Krueger” was Anna Marta Auguste Krueger (1887 – 1981), Heinrich Krueger’s niece. She was the daughter of Heinrich’s brother Carl Bertold Krueger and his wife Bertha Strehlow. In 1907 Anna would marry Charley Christian, as stated above. She was only 15 at the time of Edmund’s Christening. I was surprised by my reaction to the photographs. They seemed to come alive for me emotionally in a way that I didn’t expect. As moving and artistic and full of “vintage charm” as black and white or sepia-toned photographs can be – and believe me, I love old photographs – seeing the past colorized in this realistic way made the captured events seem visceral… tangible… in a way they had never seemed to me. I looked around on the web to find someone who did this kind of work. What I really wanted was to see some of my favorite family photographs redone in this way. To bring them from the distant past to the present, emotionally. I found a web site called scancafe.com which did a great job scanning some old family slides for me. I sent them a few photos to colorize, and I think they did an amazing job. I made Bertha’s eyes green, because green eyes are a Krueger trait that many members of the family carried or carry, including my mother. The first thing I did when I got the file was to blow it up until my grandparents faces were life-sized. It felt like looking into the eyes of someone I knew. The next photo I had done was a photo of Bertha when she was a younger woman. 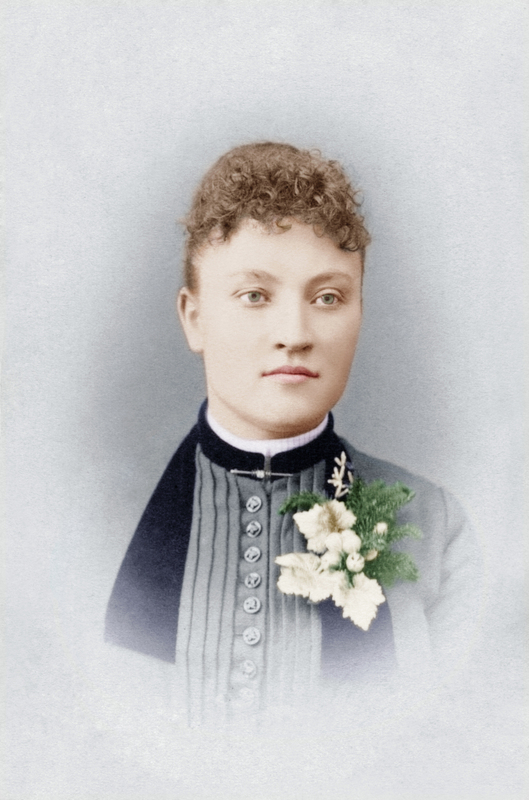 This photo was probably taken about 1885, shortly after she came to America from Roggow, Pomerania, Prussia. As much as I love this photo, she seems even more lovely with her green eyes and beautiful grey dress. This next photo is another of my favorites. 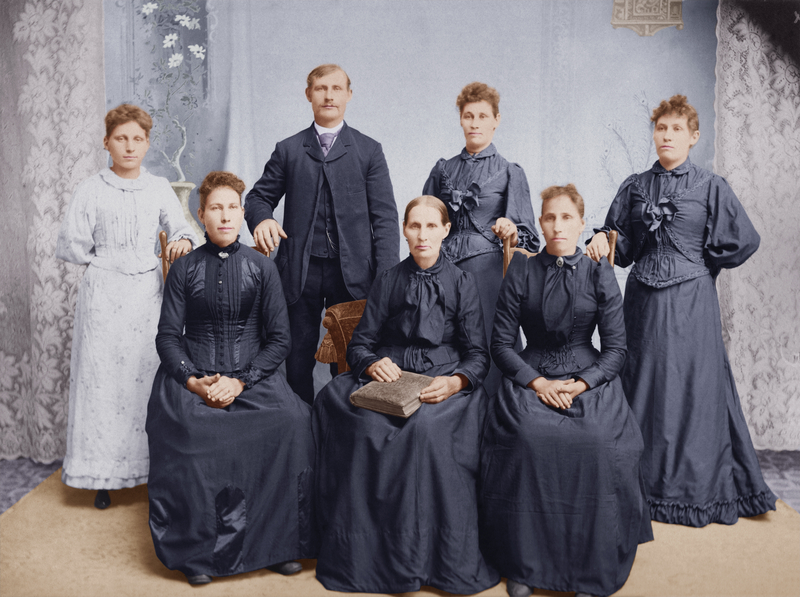 It’s the photo of the Schmidt family taken in 1893 when they were reunited after the five sisters and their mother, Wilhelmine Winkelmann Schmidt, made the trip to America from their home town of Gornitz, Posen, Prussia. The textures of the clothing are really remarkable. I love how “real” the fabrics seem.